Former President, Mr Robert Mugabe, faces contempt of Parliament charges if he fails to attend a hearing set for today on alleged leakages of diamonds at Chiadzwa during his reign which he is on record saying amounted to $15 billion. Mr Mugabe failed to show up last week on Wednesday. Mines and Energy portfolio committee chairperson, Mr Temba Mliswa rescheduled the hearing to today. 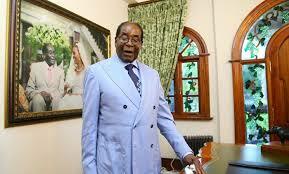 Mr Mugabe has been keeping Parliament guessing after he failed to confirm whether he would attend the hearing. He was served with letters inviting him to appear before the committee and clarify claims he made in 2016 that Zimbabwe had lost $15 billion through diamond leakages. Clerk of Parliament, Mr Kennedy Chokuda, yesterday said they had been making frantic efforts to get confirmation on Mr Mugabe’s attendance. “We have not got anything as yet. Our expectation is that he attends tomorrow’s hearing as agreed by the committee,” said Mr Chokuda. Mr Mliswa said they remained optimistic that Mr Mugabe would attend today’s hearing given that the former Head of State and Government understood the Constitution and the role of Parliament. “We expect him to have time to appear before Parliament. We expect him to co-operate and Parliament has power to summon anyone,” said Mr Mliswa. He said Parliament had been magnanimous for Mr Mugabe by arranging that he comes in the afternoon and not in the morning as initially scheduled. “In view of the time, we have resolved that we will write to Mugabe to appear before us at 2pm, taking into cognisance the fact that 9am was too early because when he was in office, he would do Cabinet meetings late in the afternoon at 2pm,” he said. The decision to call Mr Mugabe followed a claim during an interview to commemorate his birthday in 2016 where he said Zimbabwe had lost $15 billion through diamond leakages. Last week, several photojournalists gathered outside Parliament to capture Mr Mugabe’s appearance before the committee. The committee waited for over two hours for the arrival of Mr Mugabe before calling off the meeting. Mr Mugabe resigned in November 2017 after Parliament had instituted impeachment proceedings against him over a litany of allegations. Last week, Mr Mliswa read out to journalists a letter written by Deputy Clerk of Parliament Mrs Nomasonto Sunga to Mr Mugabe.